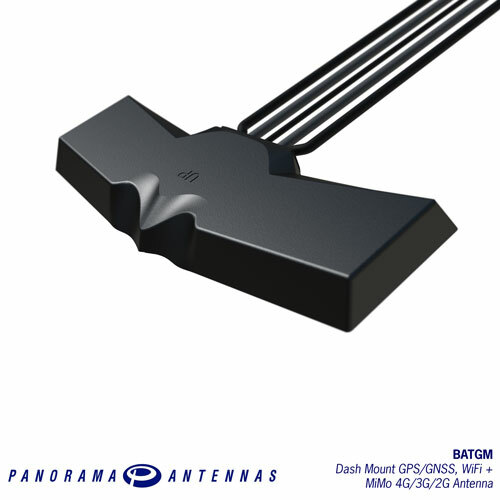 The Panorama BATG range is designed for Telematics applications requiring high-speed data with MiMo 4G and fallback 3G/2G support along with optional positioning through GPS/GNSS, and optional dual-band 2.4/5.0GHz WiFi. The isolated dual 4G/3G/2G antennas cover 698-960/1710-3800MHz and the efficient element design ensures a high first-time connection rate and an ongoing, robust communications link even in many low coverage areas. The antenna is designed to be mounted on or under a vehicle dashboard but can be mounted on any non-conductive surface. The BAT range is supplied with up to five integrated low loss cables which are flame retardant and meet the requirements of UN118.01.